How many dogs and cats are put down in Japan every year and how is this done? It is a difficult question that we have to face, but here is the reality of the legal basis for animal culling in Japan. According to the Ministry of the Environment (2014), over 100,000 dogs and cats are legally killed at the Department of Public Health (“Jichitai”) governmental animal shelters and animal welfare shelters in Japan. 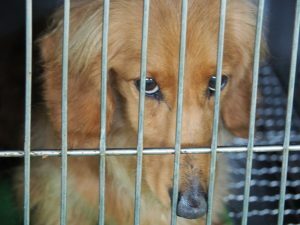 In just 6 years, between 2009 and 2014, roughly one million dogs and cats, which included both strays and owner-surrenders, were taken to so-called “dream boxes” where they faced an inhumane death by gassing. This is often a cruel process that can take 10 to 15 minutes to kill each animal. All sized dogs and cats, whether large or small, are given the same amount of gas exposure which may cause more suffering to the larger and smaller animals. 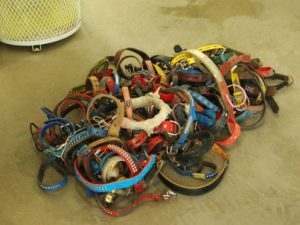 The veterinarians and staff are involved in the whole culling process and depending on the animal shelters; the vets may need to check the death of each animal by hand before they are cremated. People become veterinarians to save lives, but at Jichitai they do the opposite. It is not hard to imagine that most of them are shocked to see the reality of animal culling their first time and suffer from serious psychological distress as culling becomes their weekly routine. The Ministry of the Environment has announced that 79,745 cats were killed in 2014 and about 60% of them were newborn kittens. There is not enough staff to take care of them at most of the shelters and as a result 70% of them end up in the gas boxes. Newborn puppies and kittens breathing are very shallow so the ones that do not die from the regular gas exposure end up being cremated alive. 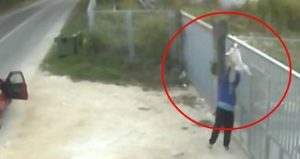 Why are innocent dogs and cats being put down in the first place? Listed below are the main reasons why dogs and cats usually end up at Jichitai. Before the 2013 animal law revision*1, pet owners could legally surrender their unwanted pets at Jichitai. It can be hard to imagine, but the Jichitai had trucks going around collecting dogs in some cities. 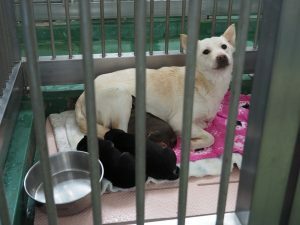 After the law change was announced, there were still 24,385 dogs and cats brought to Jichitai and taken in as “exceptions” in 2014 even though the surrenders were refused and owners advised to look for new owners by themselves. 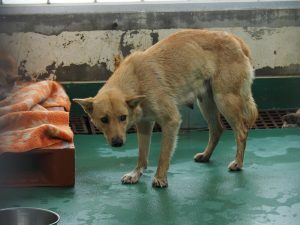 Because of the Rabies Prevention Law*2, administrative animal control officers must capture stray dogs as they get reported. As soon as they arrive at Jichitai, officers use scanners to read their microchip. A microchip implant is an identifying integrated circuit placed under the skin of an animal to help find its owner with identifying information. 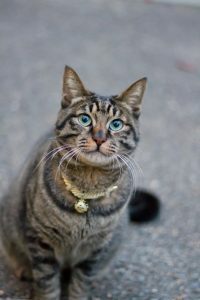 However, microchipping is not obligatory or well known in Japan so even if they find a microchip; it is often with outdated information or contains none. There is however no obligation to capture stray cats. 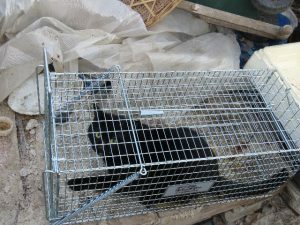 They only take the injured ones or kittens that cannot survive on their own, which over 70% of the cats captured are kittens. When people bring in a stray dog to Jichitai, the staff must check for rabies. As previously mentioned, they first read the microchip and if the owner is unknown, they release a notice that the dog is a “stray dog” on their website for 2 to 7 days. If the owner does not contact Jichitai or show up for his/her pet, then it will be determined if the stray dog is adoptable or not. However, if there is no space for the dog at that shelter, which does occur, it will be put down no matter if it is adoptable or not. When a stray cat is brought in to Jichitai, they only take injured or a newborn kittens. Then a notice of the stray cats, not including kittens, goes onto the shelter’s website. 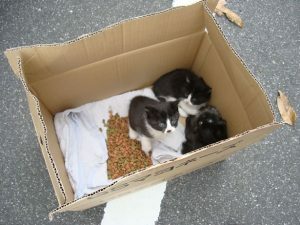 Depending on the Jichitai, people may be advised to find a new owner for a healthy cat by themselves or in the case of kittens, have them return to where they were found as the mother cat may be searching for her kittens. There are Jichitai that take newborn kittens, as they lack the ability to survive on their own; however those often end up being put down. Unlike females of most other species, cats are induced ovulators which make their pregnancy rate 99%. Usually cats go into their first heat cycle at around 6 months of age. They inbreed, and female cats typically become pregnant up to three times a year to deliver an average of 5 to 8 kittens. Therefore, it is possible that two uncontrolled breeding cats can create more than 50 cats a year*3. There were originally no wild dogs in Japan before, which means all stray dogs today are either pre-owned or descendants from domesticated ones. On the other hand, two kinds of wild cats exist. However, those that end up at animal shelters are all domesticated cats or descendants of them. Understanding the origin of where these animals come from leads us to understand the primary reason for why they are being put down, which unfortunately is these pet’s being continuously being abandoned by their owners. Before the revised Act on Welfare and Management of Animals*4 was finally passed into law in 2013, most of the owner surrenders were claimed as “inconvenience,” such as: the owners moving into a place where pets were not allowed, barking issues, watch dogs becoming useless due to getting old, cannot afford the vet fee, “not cute” anymore, the breed is not fashionable anymore, pets got sick, not willing to face the pets’ death, and so on. Notices are not posted for owner surrender pets taken into a shelter. 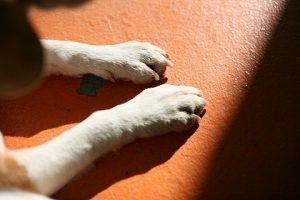 If they are determined to be adoptable, they can be: put up for adoption, adopted by the shelter as their training dogs, or taken by animal welfare organizations. However, the rest will be put down without any second chance given. These are not the only reasons; however, pet abandonment by their owners are a fundamental factor for a huge number of innocent dogs and cats being put down especially when it comes to dog owners. Why do owners abandon their pets in the first place? The Japanese pet industry is a huge market as it generates sales of over 1.4 trillion yen; however, society does not seem to be as pet friendly. •	First, people are encouraged to buy pets on impulse at most of the pet shops without a matching test to see if the particular pet suits the buyer’s lifestyle, home environment, family structure, personality, and more. They also lack in educating people about the characteristics of the breed. Many owners who give up their pets complain about their pets’ unexpected growth and barking behavior, which could be solved if there were a matching test. •	Secondly, there are not many apartments that allow pets. Many pet owners do not have “security nets,” which are places or people that their pets can be taken to to be cared for in case of emergencies. As a result many of them are surrendered as their living environment changes. •	Lastly, but not least, senior pet owners are often forced to be separated from their pets as they move into nursing homes. 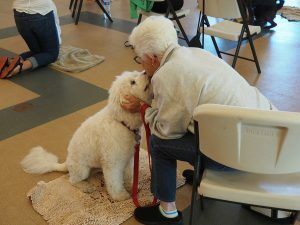 Today, more than a quarter of the country’s population is over 65 years old and there are only a few nursing homes where seniors can move in with their pets. As mentioned on our “Before adopting animals” page, pet owners must consider being responsible for their pets for the rest of their lives before adopting one. When people start realizing the importance in considering what it means to have a pet before buying pets on impulse at stores, we will be able to get closer to ending animal culling as the number of abandoned pets would decrease. The average of reduced numbers from animal culling between 2009 and 2014 is 25,699 per year. Through efforts to rescue more dogs and cats from shelters and putting them up for adoption, we will be able to achieve the number of “0” animal culling someday in the future. Unfortunately, this will not change anything for the ones that will be put down somewhere in Japan tomorrow. It’s the only “life” they have and no one can give it back once it is gone. 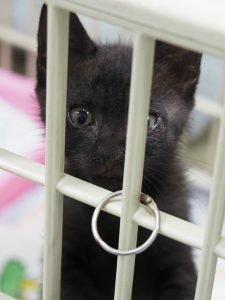 As we try to end animal culling, it is also important to make sure that each one of them is adopted by a forever home. 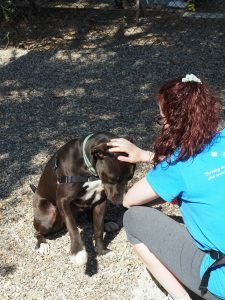 Some animal welfare organizations take in far more dogs and cats than they can, even though they do not have enough staff to care for them all. It is sad that these animals are forced to live under stress by sharing a space with so many others. The staff at these organizations does their best to find new homes for all the furry friends once abandoned by their owners. 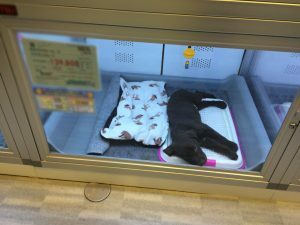 As the animal welfare in Japan still has a long way to go to improve, not only ending the animal culling, but also having a security net to give rescued dogs and cats a second chance as the next step. Our society should be a better place for us by making it an animal cruelty free place. *1 The Animal Law Revision was passed on the 1st of September in 2013, and it allows Jichitai to refuse taking owner surrender animals except in emergencies such as the owner passing away. *2 Rabies Prevention Law places the responsibility on local health and animal control authorities to catch and impound any stray dogs to do rabies testing. *3 In Japan, the cat multiplication is calculated as delivering 6 kittens per female each giving birth to three males and females each.